Ninjas are known for their ingenuity, using various tools and materials to ensure their survival. Even in the zombie apocalypse, these clever warriors put such tools as the 3 Piece Biohazard Corpse Slayer Throwing Knives to use! Reimagining the iconic kunai, the blackened 440 stainless steel construction of this ninja knife set places ancient tradition into a modern legend. Each knife of this three piece set hosts the classic silhouette, complete with a double-edged blade, slender handle, and a ring on the end. As a warning of the dangers zombies present, a vibrant green biohazard symbol is carved into the center of the knife, matching the nylon cord that wraps around its handle. An expert ninja will not use their weapons unless absolutely necessary, so keeping them in the hardy nylon sheath is the perfect way to embrace the time-honored traditions of ninjutsu. 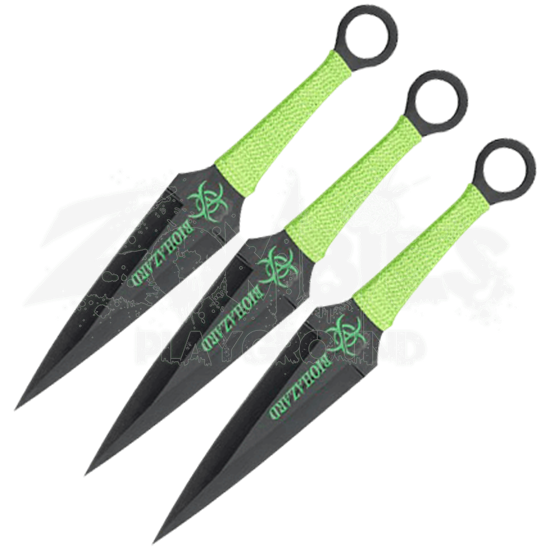 No matter if you are discreetly disposing of zombies or making your skill known to all, no true ninja would dare go on assignment without the 3 Piece Biohazard Corpse Slayer Throwing Knives!